Green Adventures offers several types of guided kayak or canoe tours to address all levels of paddling. Our kayaking and canoe tours are unique because all equipment needed for your experience is included. Upon signing up, you'll get an informative handbook that includes a detailed list of clothing and other recommended items for your trip. The Coney Island excursion is the perfect escape if you want to get away for the day, or if you are looking for an introduction to the sport of kayaking or canoeing. Trip will include a paddling lesson, an orienteering lesson, and a tour of the Kenora Harbourfront. 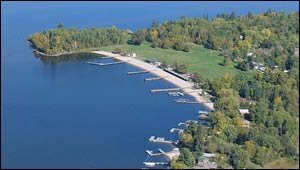 Then a paddle to Coney Island, one of Kenora's best island beaches and enjoy lunch. With a huge park and playground, there is plenty of room to play frisbee golf, volleyball, snorkel or learn a bit more about the art of kayaking. Intended as a one-day escape it can be taken as an orientation session for those who are new to the sport. 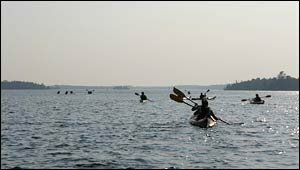 Included: Kayak or canoe rental and safety gear, paddling lesson, an orienteering lesson, tour of the Kenora Harbourfront, use of frisbee, volleyball, snorkeling gear and knowledgeable guide. Lunch provided. All prices in CDN funds & subject to Canadian tax. We accept payment by VISA | MasterCard | Debit | Cash. Green Adventures is offering two pre-planned paddling trips this August. Contact Us for full trip details and to book! Located 45 minutes from Kenora, Ena Lake is a wonderful location that offers an excellent paddling and camping experience. This scenic trip is home to swimming, fishing, and exploring - great for any family. Upon signing up, you'll get an informative handbook that includes a detailed list of clothing and other recommended items for your trip. Included: Kayak or canoe & all safety gear. Knowledgable guides, camping gear and route plan, Snacks & meals. Book Trip: Contact Us for full trip details and to book! Located 2 hours from Kenora, the Sable Islands are some of the most rarely seen but most enjoyed waters on Lake of the Woods. Join us as we paddle big waters, and challenge yourself to enjoy the outdoors to the fullest extent. Upon signing up, you'll get an informative handbook that includes a detailed list of clothing and other recommended items for your trip. For further inquires about guided kayak or canoe trips and/or route maps feel free to contact us.